So, there are so many different types of helmets that pop up from time to time, and I thought it might be a good time to look at, in my opinion, some of the earliest. Most of these early ones do not have the correct style stickers, and that makes them oddities. This first helmet to the right is really strange and it has no date on the box. It is made by a company called Sidney A. Tarrson, they were based out of Chicago, Illinois, and it is a Tarco Qualitoy (catchy name). As for stickers, there are none located in the box but there is one on the front of the helmet that is just a solid little white box with the red letters that say "St. Louis Cardinals." According to the box you could "join your favorite big league club" and the price for all of this would set you back $1. Could this be where Sports Product got the idea for their helmets? It is a plastic helmet and there were five areas for five pieces of soft foam inside at one time. You have to love the saying at the bottom of the package: "The plastic used in this helmet is the newest development in break resistant plastic." Yeah, right. . . . The second helmet to me is more interesting than the first. The helmet below was made by Roebee Industries and wouldn't you know it, it was based out of Cleveland, Ohio! 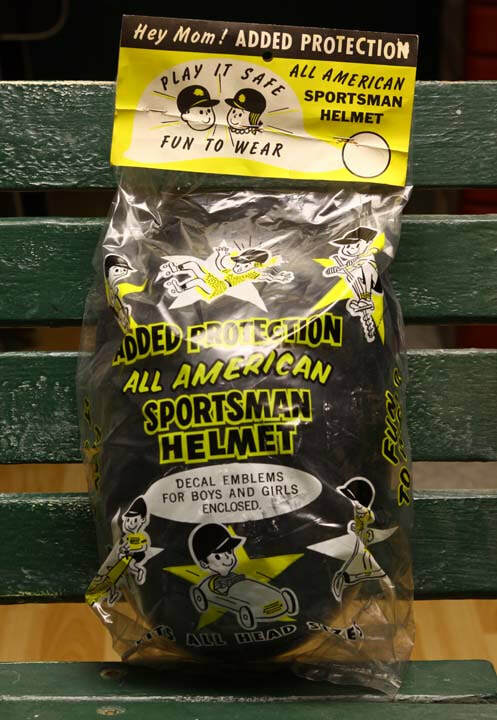 It was promoted as an "All American Sportsman Helmet" and supposedly provided protection for everything from playing baseball to soapbox derbies to motor biking which seems to me like a joke. There was no date on the package. 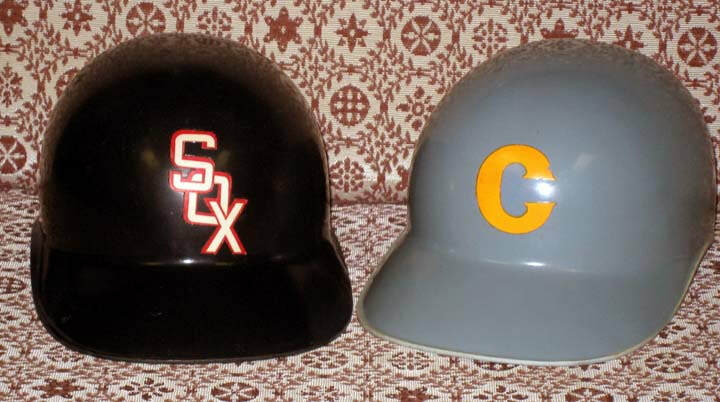 Now as compared to the first helmet to the upper right, this helmet did come with some unique logos of some of the current baseball teams that you can see below. By looking at the logos I would date this helmet to be between 1957 to 1959. These logos are from the American League teams. Reading from left to right the teams are as follows: Indians, Yankees, Athletics, Senators, Orioles, White Sox, Tigers, and Red Sox. Notice how none of the logos match the actual team logos. These logos are from the National League teams. Reading from left to right the teams are as follows: Cubs, Pirates. Giants, Redlegs, Cardinals, Braves, Phillies, and Dodgers. The coolest thing about getting this helmet is that it dates another helmet that I own. It wasn't until I discovered this helmet on eBay that I learned of the origin of the helmet to the left. The helmet had baffled me for years, so much so that I labeled it a mystery helmet. The logo didn't match up with anything I had ever seen and the helmet color was really bizarre, but it wasn't until I looked closely at the White Sox helmet in this story that I noticed that it too was missing air holes in the top. I immediately grabbed the logo stickers for that black helmet and wouldn't you know it, the Chicago Cubs logo was identical to the logo on my mystery helmet, and since I got this from a lady in Chicago, whamo, I now had an answer to my unsolved mystery. The only thing that was different between the two logos was the color, but to me that was a minor detail. The last cool detail that I assumed was that this really could be a transition helmet/time for Roebee and Sports Product Corp. I only say that because the helmets below would be evidence towards that because they both do not have holes in the top or, somebody got there hands on a White Sox sticker (ordered from here) and used this helmet for the body? Anything is possible.